The world’s top 10 supercars! Check out 10 of the world’s most magnificent and ultra-luxury set of wheels, built to break speed records and inspire acute envy. 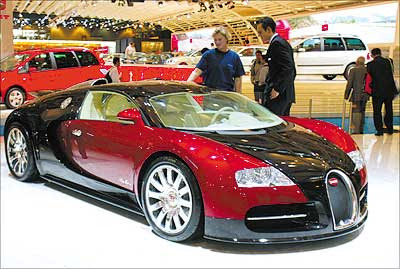 The Bugatti Veyron 16.4 from Germany is the world’s fastest, most expensive, and most powerful car in the world. It can touch speeds of over 407.5 kmph and can go from 0 to 62 mph in 2.5 seconds. Bugatti Veyron car is made by Volkswagen’s 100% arm Bugatti Automobiles. The car has been named after Formula 1 racing driver Pierre Veyron, who won the Le Mans race in 1939 while driving for Bugatti. 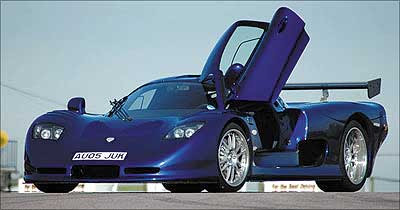 The car has a W16 engine, which is the equivalent of two narrow-angle V8 engines fused in a ‘V’ formation. Each of the car’s cylinders has 4 valves making it a total of 64 valves. The engine is fed by four turbochargers. The car also has a fantastic array of electronic equipment. The Veyron can be driven by full automatic transmission. The car’s wheelbase is 2710 mm and its overall length is 4462 mm. It is 1998 mm wide and 1206 mm in height. The car’s weight is about 1,890 kg. People admire the Bugatti Veyron 16.4 displayed at the Paris Auto Show. 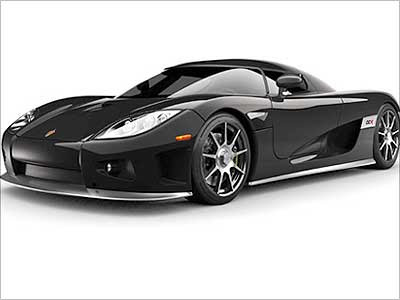 The Koenigsegg CCX is a highly expensive and extremely fast car from Sweden. It can go from 0 to 60 mph in 3.2 seconds. The Koenigsegg CCX — CCX is short for Competition Coupe X — is powered by a Koenigsegg designed and assembled, all aluminium, 4700 cm3 DOHC 32-valve V8 engine. The engine produces 900 hp on biofuel. This beauty is a two-door, two seater dream that comes with a removable hardtop that can be stowed under the front hood lid. The car’s body is made of carbon fibre or kevlar. The car’s interior too is mindboggling and the machine is packed with some great gadgets. The Pagani Zonda Roadster F is a supercar produced by Italian car manufacturer Pagani. 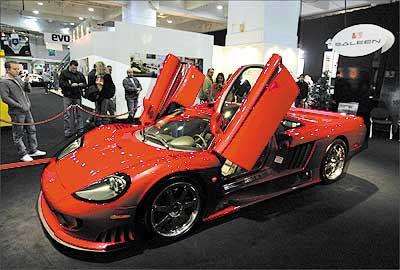 The Saleen S7 is America’s reigning supercar, jointly designed by RML and Saleen Inc. It is built at Saleen’s headquarters in Irvine, California, USA. The super car has center-locking wheel nuts with automatic safety locks; it has integrated roll protection aluminum honeycomb impact absorbing panels; its engine is equipped with two turbochargers and it comes with 3-point seat belts with automatic seat belt pre-tensioners. The Lamborghini Murcielago LP640 is a supercar made by Italy’s Automobili Lamborghini S.p.A. It is perhaps the world’s most recognised and desired car. 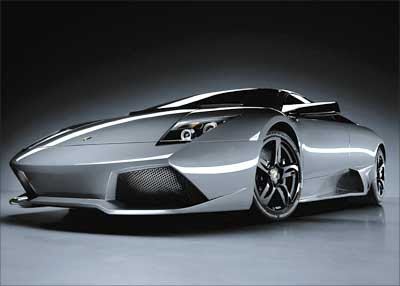 The Murcielago LP640 features an engine that is mounted ‘backwards,’ with the transmission at the very back of the car. The ‘LP’ in its name stands for Longitudinale Posteriore which refers to the longitudally-mounted, 6.5 L V12 engine, capable of producing up to 640 bhp at 8000 rpm. 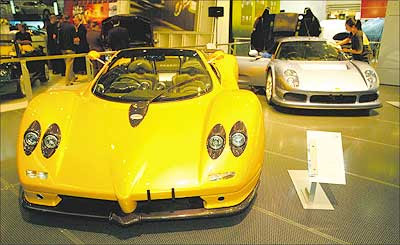 This Dutch supercar costs about $287,500 (Rs 1.3 crore) and can go from 0 to 62 miles per hour in 5 seconds. Despite its weight, the car’s super engines can gun it to great speeds. 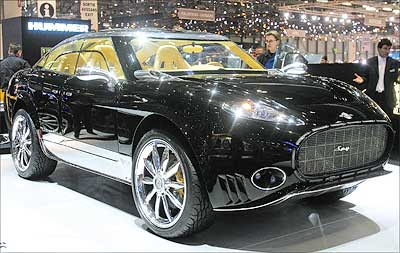 True to its supercar status, the Spyker D12 sports some pretty extraordinary gadgets under its hood. The Ferrari 599 GTB Fiorano is a magnificent 2-seat machine styled by Pininfarina along with Ferrari’s in-house design guru Frank Stephenson. This Italian supercar is Ferrari’s most powerful V-12 production that costs about $255,000 (Rs 1.15 crore) and can go from 0 to 62 mph in 3.7 seconds. The car’s weight is about 2300 kg. It’s body is made of aluminium. 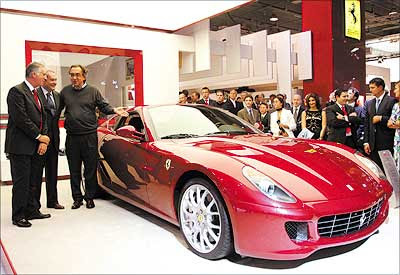 The car’s F133F 6.0 L, V12 engine produces 611 hp making it the most-powerful Ferrari road car. This head-turner’s insides too are a lot to rave about and it too comes packed with some fantastic electronic wizardry. 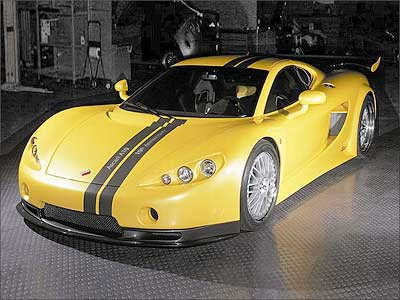 The Mosler MT900S is made of a carbon-fibre-reinforced steel frame. 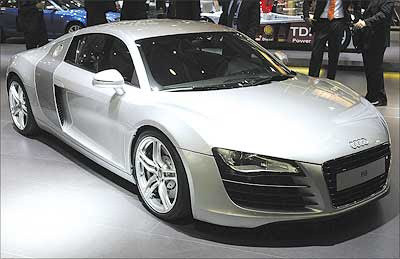 The Audi R8 is a sports car from the German automaker Audi. Audi R8 isn’t even as good as the Lambo it’s based on! I’ll take a Bugatti please! FERRARI ENZO or possibily GOD has 660hp and the ferrari gtb 599 has 611hp making it second to the enzo.